2019 BMW 1 Series Hatchback Rendered - BMW's next generation 1 Series is due out in 2019, and Whether the hatch as we understand it today will continue to bring the 1 Series badge or the reported 2 Series name, is another story, however exactly what's particular is that its design and building will end up being much more exceptional and, and it will likewise be somewhat bigger than the present generation. BMW will entirely change the 1 Series, moving from a compact to a lower section-- which will match the Audi A1-- that the German brand name wishes to make use of, despite the fact that they currently depend on the MINI. The 1 Series Hatchback as we understand it today will switch to the UKL front-wheel drive platform and will enable BMW to concentrate on a brand-new section. 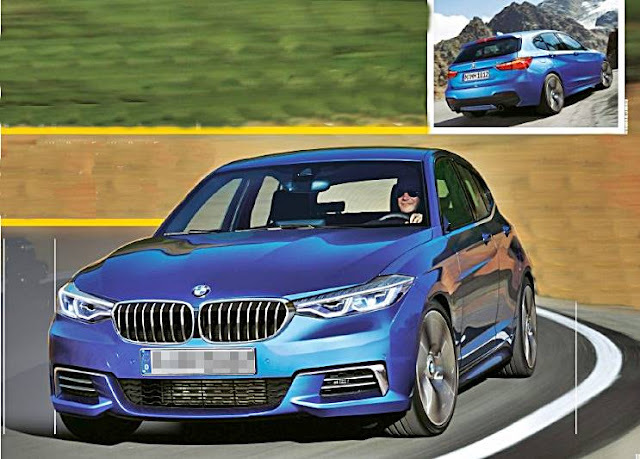 Readily available in 2 body designs, the future series of the BMW 1 Series will have 2 body designs, a "model established especially for the city", one with 3 doors and a hatchback, providing higher interior roominess than that of the MINI. The rendering revealed here constructs atop the present BMW design language, however with a little twist-- the headlights are slimmer and more angular, and complete LED lights are basic. The profile reveals a mirrorless automobile with cams to assist the chauffeur browse through traffic-- much like the just recently revealed BMW i8 Mirrorless Electronic camera. The brand-new 1 Series designs will have 3 and 4 engine cylinders installed for diesel and fuel, and an electrical eDrive; there is likewise a possibility of a stylish M variation-- this has actually not been verified nor rejected. The brand-new 1 Series will be introduced in 2018 with sales starting in 2019.